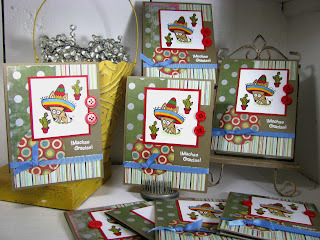 Aaaack, these are so doggone cute...now for a margarita, ah! Love the circle of pp--never would've thought of that! Can't wait to meet/greet in a couple of weeks!! What an adorable image! I haven't seen their $1.99 stamps anywhere around here! Happy New Year!!! I love your cards!! 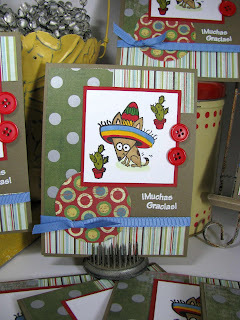 I haven't seen these stamps here, I looked on the inkadinkadoo website for the muchas gracias stamp and found it there for $2.00, but the shipping was $10.65! Guess I'll just wait for that price!!! Love your blog!